We will be marching to Parliament on Monday 8 October, despite the government insisting that our protest is banned. 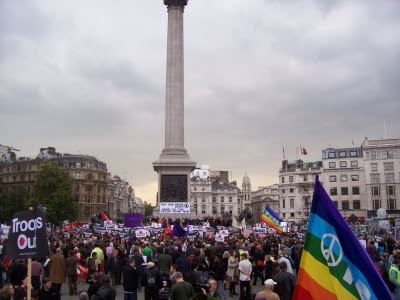 Human rights group Liberty says our march is legal and we will be exercising democratic right to protest peacefully on the day Gordon Brown makes his long awaited speech on Iraq to the House of Commons. Stop the War has been flooded with messages of support and a commitment to join our protest, including from Shami Chakrabarti (Liberty), Tony Benn, Walter Wolfgang (Labour Party NEC, Bob Wareing MP, musician Brian Eno, comedian Mark Thomas, author Iain Banks, poet Benjamin Zephaniah and playwright David Edgar. We urge everyone who has opposed the British government's support for George Bush's war, and who agrees that our right to peaceful protest must be defended, to join us on Monday. In the run up to this much anticipated general election, the leaders of each major political party have claimed to champion our civil liberties. No doubt they will now unite to ensure that this peaceful demonstration takes place.